Is there any grief like a mother’s when she loses her child? Stabat Mater, a Latin hymn that can also be recited in prayer, immerses us in the Blessed Mother’s intense sorrow at seeing her beloved Son, our Lord Jesus Christ, dying on the cross in His Passion so that we might have Eternal Life! 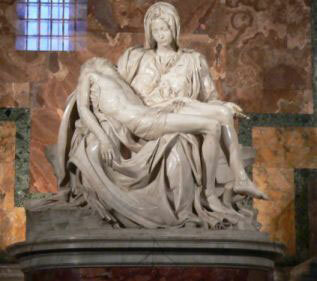 Its title comes from its first line in Latin “Stabat Mater dolorosa” (roughly translated “the sorrowful mother stood”). A Franciscan friar named Jacopone da Todi is said to have written the original text of the Stabat Mater in the 13th century, although some scholars have attributed it to Pope Innocent III, among others. There are over 60 English translations of the Stabat Mater, including this one printed below. It has been so popular that numerous composers including Bach, Vivaldi, Haydn, Schubert, and Verdi have set the original Latin text to music. The Stabat Mater was used frequently in the Liturgy for centuries before it became a sequence (a hymn spoken or sung before the Gospel) in 1727 for the feast of the Seven Sorrows [or Dolors] of the Blessed Virgin Mary on September 15th. Its use as a sequence is optional now on that feast day (now called the feast for Our Lady of Sorrows), but the hymn is often prayed with the Stations of the Cross at Lent. Imagine seeing a loved one, a very special loved one, in fact, undergoing such physical and emotional agony. Now add to that the thought that you can’t do anything to help that person, who’s suffering all the more to see your anguish! From what tradition tells us, the Blessed Mother had a strong sense of what was coming way before Christ’s Passion. When she presented her little baby Jesus in the Temple, fulfilling Mosaic law, a “just and devout” (Lk 2:25) man named Simeon, enlightened by the Holy Spirit, foretold both our Lord’s greatness, saying he would be “a light of revelation to the Gentiles and a glory for thy people, Israel,” and His Passion, calling Him “a sign that shall be contradicted” (Lk 2:32 and 34). For her part, the Blessed Mother loved her Divine Son so fully and deeply that His suffering became hers, again for our sake! And no doubt Mary, like our Lord, felt a special anguish for those souls who would be lost in lives of unrepentant mortal sins in spite of His Passion. It is the heartbreaking counterpart to those joyful paintings of Mary we see, especially at Christmastime, holding her newborn Son in her arms. She was there for Him in any case, no matter what the circumstances. In reflecting on Christ’s Passion in such an intimate way in the Stabat Mater, as with the Stations of the Cross, our hearts should be filled with gratitude as well as sorrow for His sacrifice for us, so that we can love Him as he loved us, and show others that love by how we treat them. In the Stabat Mater we ask Mary for the grace to share the depth of her love for her Son (as in stanza 10, addressed to her, which reads “make me feel as thou hast felt; make my soul to glow and melt, with the love of Christ my Lord”). 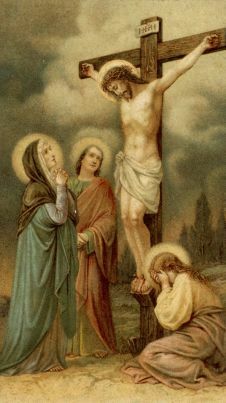 We also ask to grieve with her in our hearts at the foot of the cross (as in the Stabat Mater’s stanza 12, which reads, “Let me share with thee His pain, who for all my sins was slain”) while we offer up our own troubles for our redemption, with deep contrition for our sins. As St. Paul said, “we know that our old self was crucified with Him…that we might no longer be in slavery to sin,” (Rom 6:6) that is, to our old sinful ways. We are still sinners, but with God’s help, through prayer and the sacraments, especially the sacrament of Reconciliation (otherwise known as confession), we can share in His triumph over sin and death! When the Blessed Mother experienced, along with her Son, such an intense, bitter martyrdom of love that awful day at Calvary, could anyone present there have imagined that anything good would come out of it? Yet something quite wonderful did occur! Christ, in His death and resurrection, paved the road for our salvation and “life everlasting” with Him in Heaven. Similarly, in the Stabat Mater’s stanzas 18-19, we implore her to assist us at that crucial moment when we stand before her Son, when we’ve passed from this life (as in Stanza 19 which reads “Christ, when Thou shalt call me hence, Be Thy Mother my defense”). Then Jesus will see how well we lived by how much we loved, not by the size of our house or of our bank account. Keep in mind, though that the Blessed Mother is more than ready to help us follow her Son with the graces we need throughout our lives, not just at our judgment. Praying to Mary and asking for her assistance has never been meant to put her ahead of her Son or to partake in some sort of idol worship when we look at her image in a statue, as some might fear. We pray to Mary and through Mary to Jesus! If we could speak to her face to face about her Son, she would no doubt instruct us to “Do whatever He tells you” (John 2:5), as she told the servers at the wedding feast at Cana before His first miracle. Jesus might have had an easier time changing water into wine there than in changing some of our more hardened hearts, but his mother can always help us to “be made worthy of the promises of Christ” (as we pray in the Rosary and the Angleus) if we’re sincere in our request for her aid. Remember, in sharing with Mary her Son’s anguish, as mentioned earlier, we might then be able to share in His triumph over sin and death as well! As we read in the Stabat Mater’s 20th Stanza “while my body here decays, may my soul thy goodness praise, Safe in paradise with Thee. Amen.” Amen, indeed! Anyway you read the text of the Stabat Mater, whether in this version or others, you can’t help being moved. May it stir in your heart a greater love and devotion both for our Lord and His Blessed Mother!